As I was growing up I came to learn a lot about myself, who I wanted to be and what I wanted to do with my life. My first job was as a pastry chef in a small town in Victoria called Yarragon. I was in high-school with average grades, and I played state level basketball around Victoria. Mum and dad gave up their weeknights and weekends to make sure I was trained by the best, to be the best. I started working weekly on a Friday or Saturday night. My shift would begin at midnight and run for about 8 hours, finishing around 8am on a Saturday or Sunday morning. Being young and full of energy meant the expression ‘burn-out’ did not exist. I would play state league basketball on a Friday night, get home by 11.30pm, hop in the shower, go straight to work, get home at 8am, sleep for 3 hours, wake up and go and play football somewhere in the Gippsland area. I never wanted to let anybody down, whether it was my team mates or my boss, Les the baker. One weekend I was asked to play in a competition in Adelaide over an Easter Long weekend, which is also one of the busiest weekend for the bakery. Now Les and I normally work alone – just me and him – so if I couldn’t do my shift, or had to cancel last minute, it would have really put him out. Rather than let him down, I decided that I would drive to Adelaide with my team, play 3 games, fly back to Melbourne for the Saturday night pastry shift, before getting back on the plane with only 2 hour sleep to return to Adelaide to finish out the basketball tournament. I missed only one game, but I didn’t let anyone down. As life has progressed I’ve always maintained my want and drive to help people against the odds, no matter how silly it sounded. There’s always a way. It’s impossible to be in two places at once, but that’s always based on the way you look at the situation. Technology can allow me to be everywhere at once. Right now I’m on your laptop. Tomorrow I could be in front of you, in a book, in an article, a video, a paper, a photograph that’s been circulated hundreds of times thanks to the Accounting Awards on Friday night. Life is all about perception, how you look at it, through the lens that you choose. You control your limitations, you decide what your barriers will be, and only you can bring those barriers down. Life’s not easy. It’s not always clear what I should be doing and when I should be doing it. My only constant, is that I know when I can help someone. I know where I can add value and I know that when I don’t know the answer that I’m resourceful enough to find out the information. 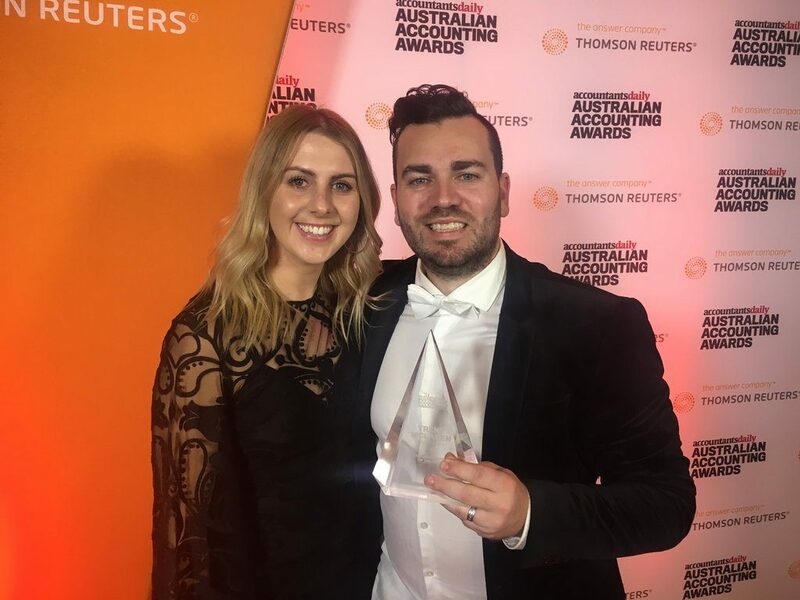 This has been my journey to becoming Australia’s Thought Leader of the Year in the accounting industry. I’ve spent the last 5 years working alongside bookkeepers, accountants, developers and small business owners, looking at every different perspective of the equation that is their day-to-day. There are a lot of great people in this industry. A lot of amazing stories that never get the airwaves they deserve. My journey is a collation of every story I’ve ever come across. I’ve had a front row seat to the greatest disruption of our time. I’ve witnessed the comeback stories, the break-ups, the divorces, the wins, the surprises and the mysteries. And with every story I pledge to be able to use that silver lining to help build someone else’s story. I’m using my interpretation of the world around me to help others, to assist one another. Thank you again to Momentum Media for hosting 2017’s accounting awards, thank you to Intuit Australia for your support and encouragement. Thank you to my friends family and wife for being by my side when I need it most. Thanks for jumping onto my journey, I feel like we’ve come so far but we’ve got so much further to go. We’ll see what comes next in 2017 and beyond. See you soon.